Over the weekend I got my Ashford rigid heddle loom out from under the bed. Yes, that is as scary as it sounds. It had dead spiders and mysterious under-the-bed fluff on it and was well hidden by all the other stuff that’s been sholved under the bed over the last few years. I wasn’t even sure if it was there, but managed to locate it from the feeble beam of my kindle clip-on LED reading light. After a good clean and locating of misplaced accessories I was good to go! The only problem was, it had been some years since I last used the loom and couldn’t remember a single thing about how to set it up. Cue another hunt for the instruction book. The idea with getting the loom out again was it occured to me that weaving is a brilliant way to use up all the leftover yarn that isn’t really enough to knit a project from, and perfect for some of my handspun singles experiments that never made it to the plying stage. I’m using different monochrome colourways of Woolyknit Diggle DK for the warp, and contrasting it on the weft with a mix of colourful handspun singles, Donegal Tweed leftovers from a yarn swap, and some other similar yarns in warm colours. I’m totally undecided what it’s going to be exactly, but it could definately be a nice wrap or just be a throw for the back of the armchair. Mostly, it’s been an oppourtunity to rediscover weaving, and to learn that I CAN warp up the loom properly if I take the time to follow the instructions rather than thinking I know better! 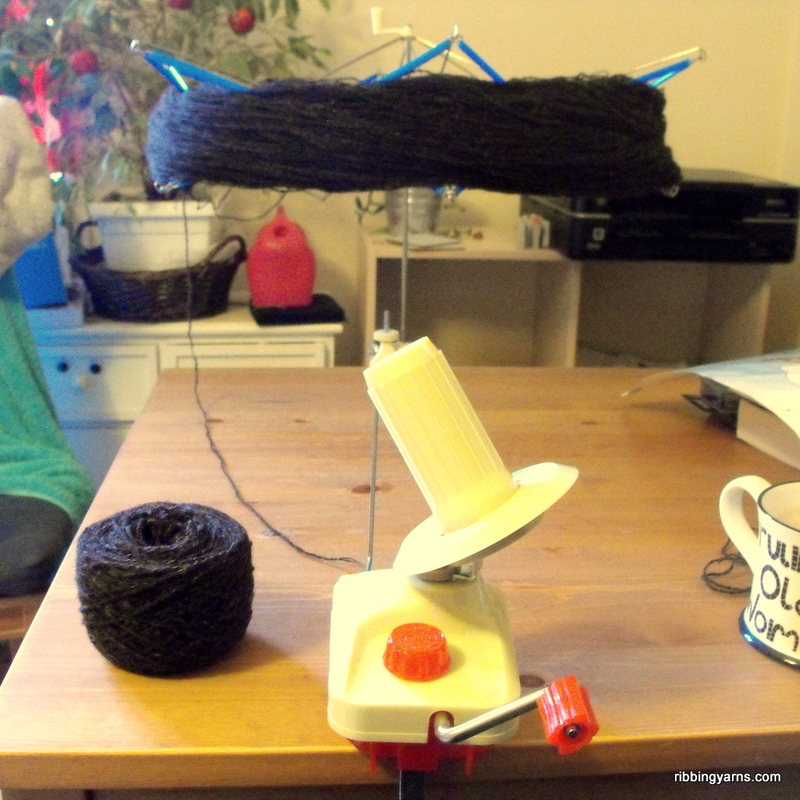 I also meant to share about my new wool winder and swift, which were great christmas presents! It’s a challenge to find the space to set it up when I need to use it, but it does the job. 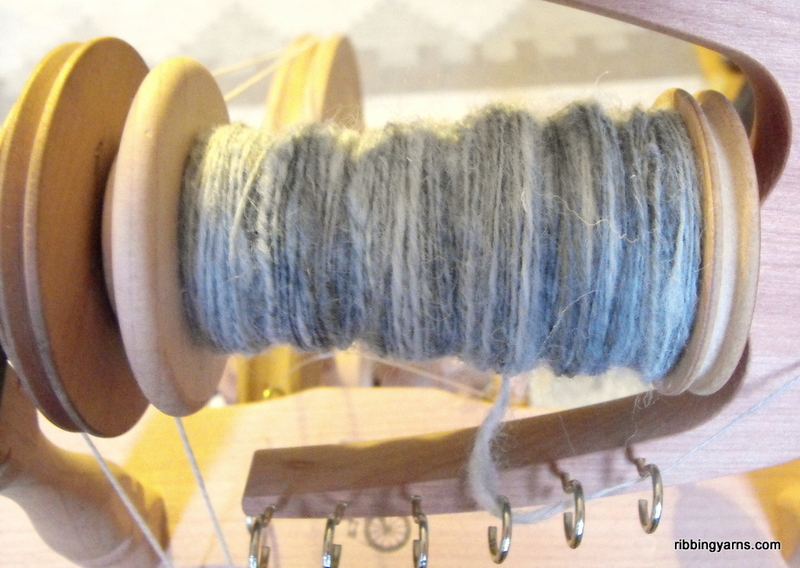 In the photo I was winding a MASSIVE hank of hebridean 4ply that challenged the swift a bit. Since this photo was taken I’ve learned that it’s much easier to have the swift and wool winder at the same level as each other to avoid the yarn catching on the swift’s little metal hooks as it winds. Finally to the spinning, which would have been included in last week’s WIP Wednesday if I hadn’t run out of time! At the moment I’m spinning a blend of Shetland tops and a British wool blend of bluey-greys that remind me of a very stormy sea. That was the inspiration for this blend, and an opportunity to get creative in blending different textures and colours together. It’s a little unpredictable to spin as the Shetland is hairier and has a shorter staple length, where as the British wool blend has a uniformly longer staple and more lustre. having said that, I love the way it looks together, and different colours are picked out as the light changes through the day, just like a real stormy sea! One bobbin is nearly full now, and I’m looking forward very much to seeing how it turns out. I believe it may be destined for a shawl to really show off the tones of the yarn. Do you also love to spin or weave? 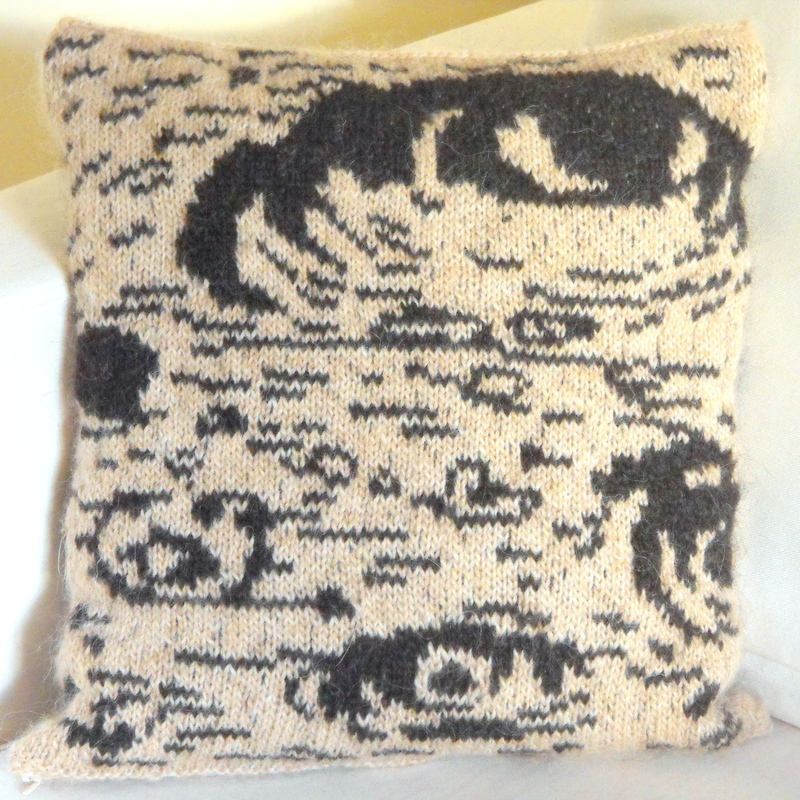 Maybe you have a crafting tool you can’t live without, or tips about how to blend different kinds of fibre. As ever, I’d love to hear about it- leave a comment in the thread below. This entry was posted in Spinning and tagged Ashford Loom, Copenhagen Yarn Lovers, Craft, Håndarbejde, Knitting Copenhagen, Skein Winder, Spinding, Spinning, Strik København, Strikke Klub, Væve, Weaving, Winding Wool, Yarn. Bookmark the permalink. One reason I love my bobbin lace is because of the pretty tools. 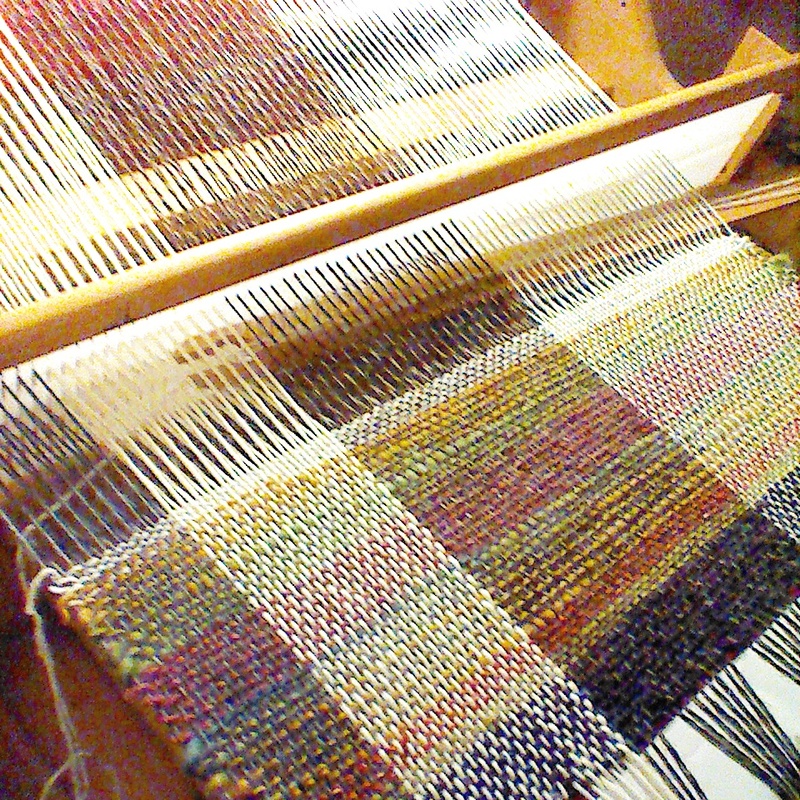 Love the weaving – such a beautiful mix of colours!